Being an artist is much more than just spending time alone in your studio. The real work is finding places to show what you’ve been working on. Step 1. Find all of the galleries near you that you can deliver your work to. Step 2. Look at their previous shows and figure out what kind of work/artist they deal with. A lot of times galleries function as co-ops and mostly work with their members, so that eliminates at least half of the galleries around me. I put the majority of my funds into my materials and can’t afford the monthly bill for display space. Step 3. Wait for them to put out a call for artists. It can be tough to find a gallery whose ideas for shows get you excited about participating. Sometimes, if you’re lucky, you have already created something that lines up perfectly with their guidelines. Step 4. Submit to the show and hope that that the juror sees continuity between your work and their theme. It’s been a freaky great month for me. I’m stoked to say that I have four paintings hanging in two galleries in the Triangle. Both are group shows that I was really excited about participating in. The common thing about these calls is how open-ended the themes were, which is awesome because it allows me to be in control of my own subject matter. The Visual Art Exchange has been my favorite art venue for the last year. Their shows last for about a month and I really like how youthful their themes have been. This month they are hosting W.E.R.D., a showcase of artists who utilize text in their work. I have several paintings that I could have submitted for this and I ended up using Best of Luck, plus creating one specific for the show. The idea came to me one night and I got really excited and cranked it out in a matter of a week. It’s 24 X 24 and painted on plywood. 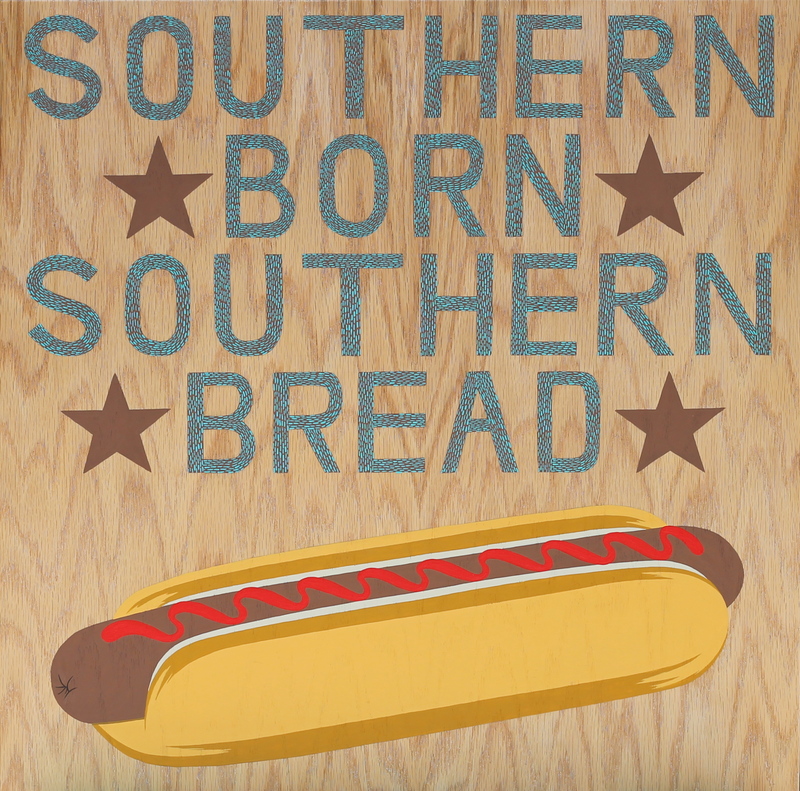 The text says Southern Born Southern Bread and is a pun on a common phrase. This show opened July 3rd and runs through the 30th in Raleigh. The second call for artists that I responded to came from The Durham Art Guild. Their show, Illustrious, showcases local artist who are exploring illustration. For this show I framed up two paintings on paper based on the Elvis series I started working on this past winter. When I was dropping my work off for this show I had the opportunity to look around and was blown away by the other talent. The opening reception was July 17 and the show is up through August. If you’re around Durham and get the chance to visit the SunTrust Gallery, I guarantee you won’t be disappointed. I’m hoping to meet some of the other artists, which brings me to the last step in the process – networking.